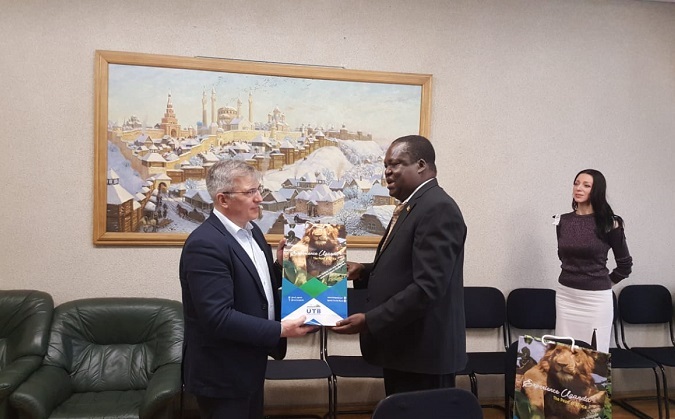 His Excellency Johnson Agara Olwa, the Ambassador Extraordinary and Plenipotentiary of the Republic of Uganda to the Russian Federation met Mr Artur S. Nikolaev, the First Deputy Chairman of the Board Organization Department Chief of the Chamber of Commerce and Industry of Kazan, Tatarstan today 21 March 2018. The purpose of the meeting was to initiate cooperation between the Chamber of Commerce and Industry of Kazan with the Republic of Uganda in the areas of trade, Investment and tourism. Ambassador OLWA exposed the members of the Chamber to the trade opportunities in Uganda and invited the business men in Kazan to do business with the people of Uganda. Tatarstan is one of the most economically developed regions in the Russian Federation. The Republic of Tatarstan is rich in natural resources, powerful and diversified industry, high intellectual potential and qualified human resources. 2.2 % of Russia's farmlands are used by the Republic of Tatarstan, 4.5% of the country's agricultural produce are manufactured in this Republic. The share of industry in the Tatarstan gross regional product is 43.2%, construction - 9.0%, transport and communications - 6.5%, agriculture - 7.5%. The industrial sector of Tatarstan is presented by the oil-gas-chemical complex (oil production, manufacturing of synthetic rubber, tyres, polyethylene, and wide range of oil refinery products), major engineering enterprises manufacturing competitive products (heavy trucks, helicopters, aircraft, aircraft engines, compressors, oil-gas-pumping equipment, river and sea vessels, commercial and motor cars), development of electric and radio instrument engineering among others. The share of small and medium-size business in gross regional product makes 25%. Technoparks are actively developing in the Republic of Tatarstan. There is a lot of opportunities for business between the people of Uganda and the people of Tatarstan if explored and exploited. Ambassador OLWA has been invited to participate in the upcoming Investment Forum which is due to take place in Kazan in May 2018. Both parties were positive about cooperation and the Chamber of Commerce and Industry of Kazan looks forward to hosting the Chamber of Commerce and Industry of Uganda in the nearest future.